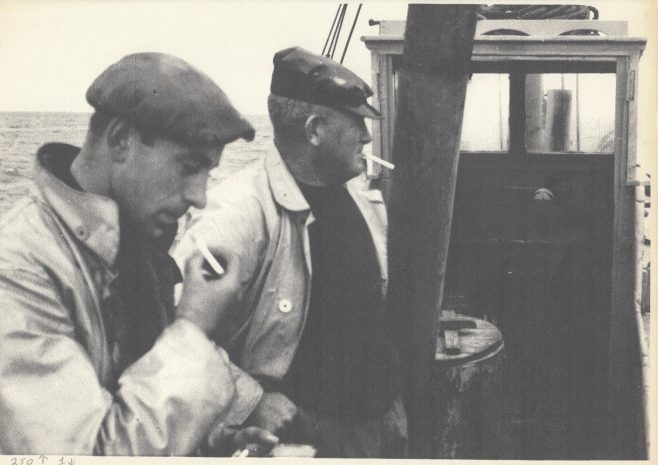 Keith Willacy and Sam (Gut Sam) Baxter aboard “Connie Baxter”. This boat was registered at Lancaster as LR 22 and was built by Crossfields of Arnside in 1917 for owner/skipper Samuel Baxter. She had an overall length of 31ft 8in. A beam of 10 ft and weighed 8.9 tons. She was smack rigged with a mainsail, topsail, jib and staysail and had an auxiliary motor, and a crew of two or three.